We arrived late Saturday night–actually 1:30 am Sunday morning. I began to wonder what Ecuador was like when our van to the hotel had a guard armed with a semi-automatic pistol and wearing a bulletproof vest. The hotel entrance door was manned by a similarly equipped guard. Apparently this is a late-night precaution only, as both were absent in the morning. 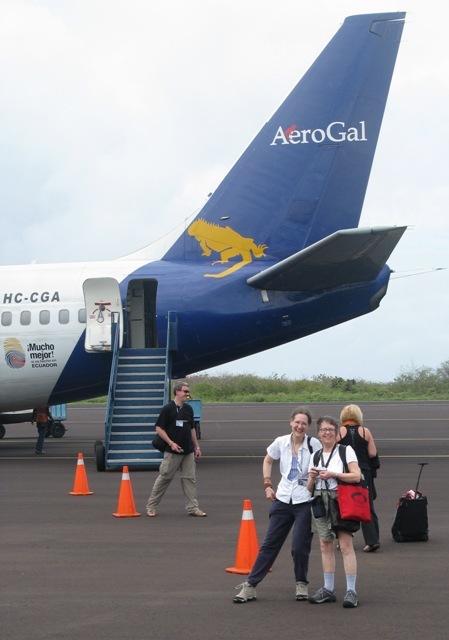 Sunday morning, Mar 22, we began to meet others on the trip at breakfast, then we all took a van back to the airport for our flight to the Galápagos. 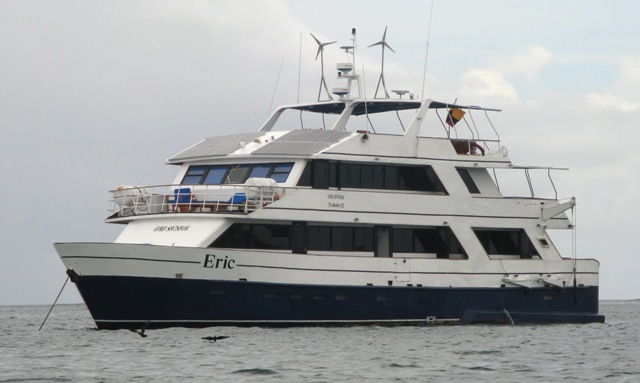 After the flight to Puerto Baquerizo Moreno on Isla San Cristóbol* and the necessary Galápagos-entry paperwork, we were shuttled by van to the dock and by panga to our boat, the M/Y (motor yacht) Eric. The Eric is one of three nearly-identical sister ships, including the Letty and the Flamingo, that travel together over the same route. It is a 300 ton boat of about 75 feet, carrying a crew of 11, including naturalists, and carrying up to 20 passengers. This small size meant that our entire group of 16 people had the boat to ourselves, providing opportunities to get better acquainted with our tour group than probably happens in the larger tour boats and ships. I believe most tourists fly into Isla Baltra to begin their tours, but we had a little historical parallel: Charles Darwin first landed in the archipelego on Isla San Cristóbol. So, I’m glad to have started my trip there, too. Preliminaries included getting our wetsuits and snorkeling gear for the week, which were tested after our first (and rough!) wet landing at Playa Ochoa, a short ways from Puerto Baquerizo Moreno. 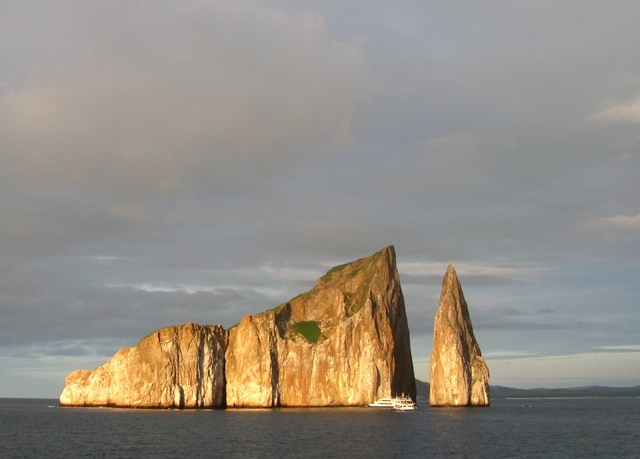 We then headed northeast to Léon Dormido (Kicker Rock), a remnant lava cone rising 500 feet out of the ocean. We spotted our first sealife on this leg of the trip, several whales. You can get a sense of the size of Léon Dormido by comparing its height to the height of the Letty and the Flamingo at the bottom of the divide in the rock. It looks especially beautiful at sunset, as you can see in the photo. 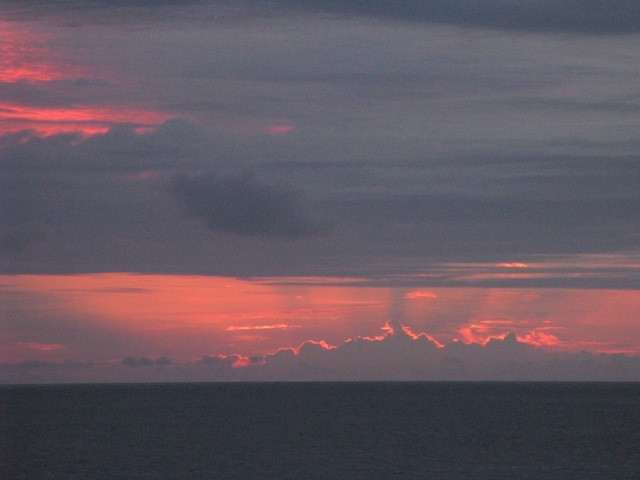 As darkness fell, we were treated to the first of many beautiful sunsets on the water. After dinner we all headed off to bed and the boat began what was to become the nightly pattern of cruising to another island while we slept. When we awoke in the morning, we were at Isla Genovesa, having also made the first of four crossings across the equator in the Eric. 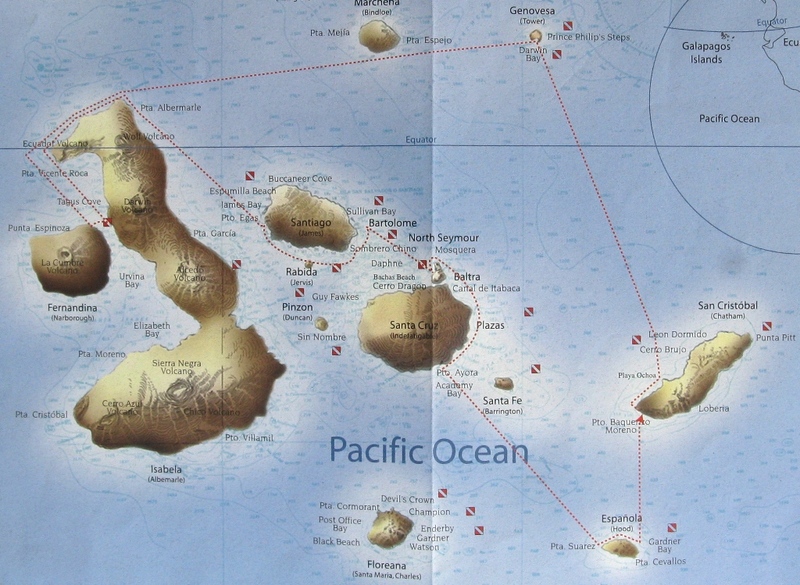 * Below, for reference, is a chart of most of the archipelago, showing our route around the islands. Isla San Cristóbol is the eastern most island, at the lower right, and Puerto Baquerizo Moreno is on the leftmost tip of the island. From there, you can follow our route.